Indego, Philly’s current bike share system, needs more flexibility if cycling can continue to expand in the city. There are many reasons that Philadelphia should get serious about expanding bicycle sharing. For every two miles a person bikes instead of drives, they save society $1. Adults who bike to work are healthier. Bike share can improve access to jobs in low-income communities. And even a small reduction in driving causes a large drop in traffic and decreases demand for on-street parking. But the current bike share system needs more flexibility if cycling is to continue to expand in the city. PlanPhilly recently reported that city officials are looking to boost bike share by considering dockless technology. This is a positive move that could provide more Philadelphians with affordable and accessible mobility, increase diversity in bike share users, and increase the city's bicycle mode share. Philly should embrace dockless bike share as the next step in expanding the city's transportation options. But don't we already have bike share in Philly? We do, but Indego, which launched here in 2015, requires users to pick up and drop off bikes at an anchored location known as a dock. 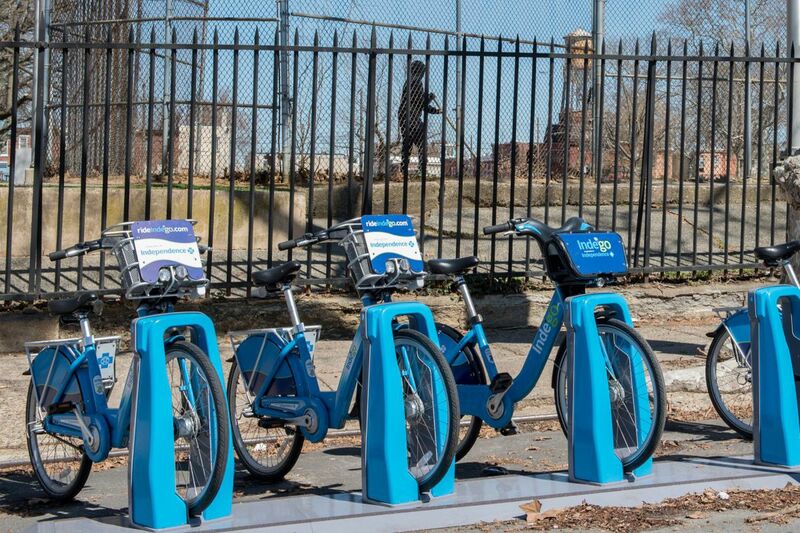 Indego currently provides the city with over 120 docking stations and 1,200 bicycles. So why do we need something different? Indego relies heavily on docks concentrated in Center City, but getting bikes out into the neighborhoods is important. However, it's costly and difficult within the current system. You cannot just put a single dock into a neighborhood. It needs to be connected to the system. There are no current plans for Indego to go to neighborhoods like West Oak Lane, Pennypack and Roxborough. There are no docks below Snyder Avenue, so you can't take a bike down to the stadiums. In a dockless system, bikes do not need to be returned to a set place, because they are equipped with technology that makes the back wheel inoperable when locked. The bikes are unlocked by using a mobile phone app to scan a bar code on the bike. Without a dock, bikes can be left anywhere, in our parks, on sidewalks, next to bus stops, in front of homes. With dockless bikes, people can and will go anywhere. Why can't Indego just expand to those neighborhoods? Expanding systems like Indego takes time and is a costly investment. In Philadelphia, the city owns the program and bikes but contracts with a private company for operations. While there are plenty of riders in the system, the user charges alone do not fully cover the cost of the program, and so it is subsidized by private sponsors and foundations. Substantial capital is needed to expand the program. So people can just leave bikes anywhere? Won't that clutter up the sidewalks? In a city like Philly, with narrow, crumbling streets, this can seem daunting for users. Many pedestrians already find it challenging to navigate our sidewalks. These are real concerns; I do not want a wheelchair to be blocked or someone's grandmother to trip over a poorly parked bike. But to alleviate pressures on our sidewalks, the answer is not to hinder one type of transportation with proven benefits. Instead, the city should commit to more bike parking. One car spot can accommodate at least 15 bikes. If these bikes aren't tethered to anything, won't they get stolen? Dockless bicycles can be carried, but I really doubt that many people are going to carry a 40-pound bike up to the Ben Franklin Bridge just to see it splash, as one PlanPhilly writer joked. Bikes — both shared and owned — are sometimes stolen, as are cars, but that doesn't mean we don't deserve more and better options. Bikers never obey traffic laws. Won't this just put more bad riders on the street? Just as there are bad drivers, there are also bad bikers. Research shows that bad drivers are the more deadly to all road users. Having more bikers in the city is a good thing. Statistically, the more bikers on the road, the safer biking becomes in a city. In Philadelphia and several other peer cities, the number of cycling deaths and severe injuries fell between 2007 and 2014 as cycling rose substantially. Across the country, bike share has overwhelmingly proven to be safe. But if you still have concerns about more bikes having to use the road with motor vehicles, the answer isn't fewer bikes. The answer is asking City Council and the mayor for more protected bike lanes and complete streets. Has this worked anywhere else? Philadelphia can learn from Washington, where the first public-private partnership bike share system began in 2012. In September 2017, D.C. launched a seven-month trial of dockless bike share. In October 2017, the dockless bikes rode on 56,477 trips, and there's growing evidence that those riders are more diverse. CityLab reports, "It's hard to back that hypothesis up with numbers; private bike companies don't collect racial demographic data on their riders. But the data they do have, in conjunction with the anecdotal observations of bike advocates and riders across the city, suggest that dockless bikes are indeed changing the face of D.C. bikers."